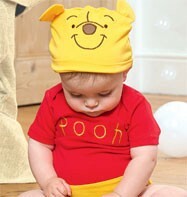 Transform little ones into Winnie The Pooh with this Disney licensed Winnie The Pooh Costume. This Disney red and yellow two piece baby bodysuit includes a super soft jersey jumpsuit that is embroidered with 'Pooh' for extra detail. It is finished off with an adorable Winnie The Pooh hat.. Size Info:	Age 0-3 Months, 3-6 Months, 6-9 Months, 9-12 Months, 12-18 Months and 18-24 Months. 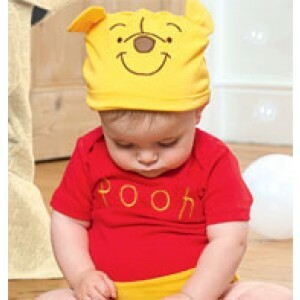 Transform little ones into Winnie The Pooh with this Disney licensed Winnie The Pooh Costume. This Disney red and yellow two piece baby bodysuit includes a super soft jersey jumpsuit that is embroidered with 'Pooh' for extra detail. It is finished off with an adorable Winnie The Pooh hat. Size Info: Age 0-3 Months, 3-6 Months, 6-9 Months, 9-12 Months, 12-18 Months and 18-24 Months. Material:	100% Cotton exclusive of trims. Fastening:	Bodysuit has popper fastening. Cleaning Care:	Machine wash. Do not tumble dry. Do not bleach. Do not iron. Do not dry clean.